Home » Posts » Attentionology for K-5 Teachers » Start the School Year with a Big Welcome to a World of Learning! 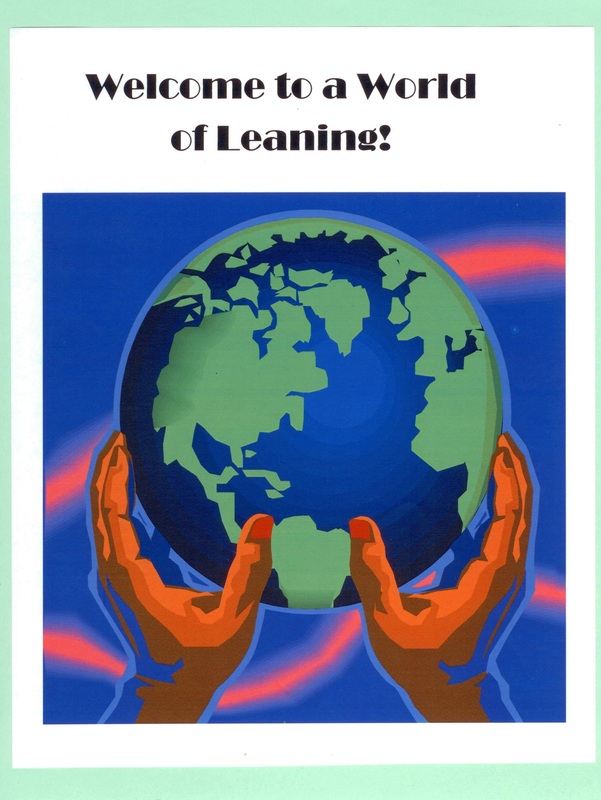 Welcome to a World of Learning! is an attention-getting theme for the start of a new school year. Need an exciting, attention-getting theme to welcome students at the start of a new school year? Center a big colorful graphic of a globe on your classroom door or bulletin board next to your door. Add a header that reads, Welcome to a World of Learning! Surround the globe with Passport Name Tags; one for each student in your class. Kids love to travel. 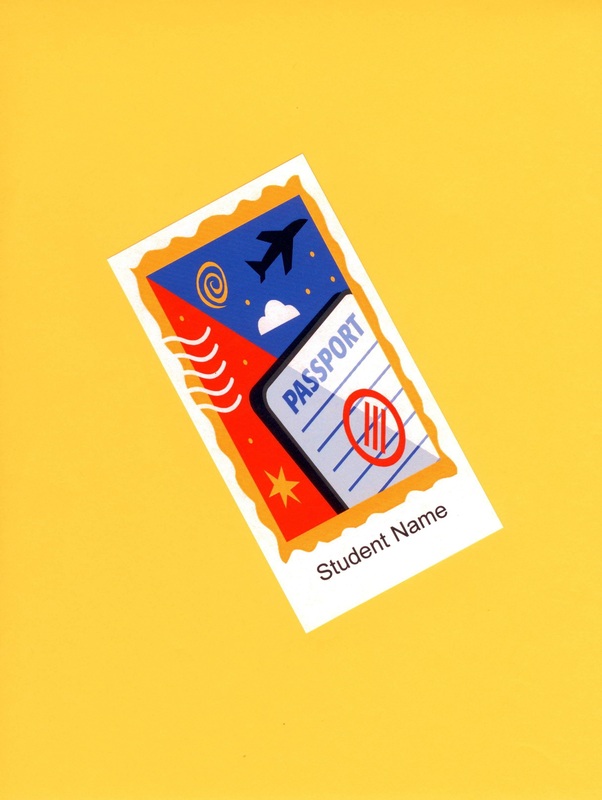 Post a Passport Name Tag for each student on your door or bulletin board. This creative decor does more than greet kids with eye-catching graphics. Welcome to A World of Learning (subject) ! – Incorporate this versatile welcome theme into your set-up of learning centers. For example, you can make a sign for your math center that reads, Crossing Continents to Master Math Skills. 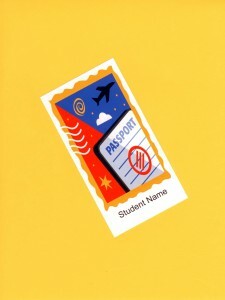 Make extra copies of generic pretend passports to give to students as “tickets” to visit learning centers. Optional: print the passport graphic on different color copy paper and color code the “tickets” for different centers. Welcome at (subject) Lesson Time – Make extra copies of the globe graphic to use for lead-ins to lessons. Welcome to a World of Learning! is a durable theme. Carry this engaging concept forward…to keep kids open to the opportunities and adventures that you offer in school. Connect the theme of Welcome to a World of Learning! with other activities as the year progresses. Imagine pebbles or small stones each as a poem to be cast into circles of water in today’s global community. 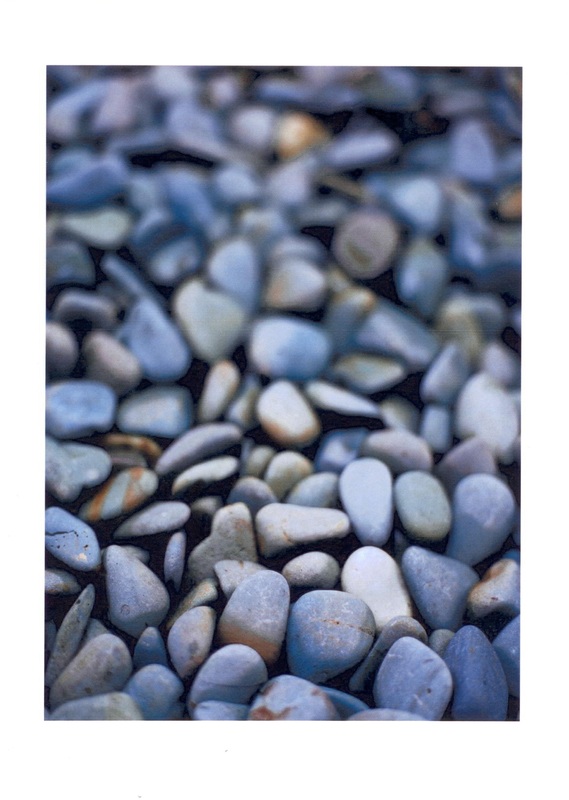 Skipping Stones for Poetry from Around the World – Buy or find small pebbles or stones, enough to give one to each student. Tell the class that you want to welcome them to a world of poetry; poems to hear and poems to write. As you distribute the pebbles to students, explain that each pebble is like a single poem. Ask the class to imagine that the pebbles in their hands are poems. Skipping Stones is (also) the title of a publication that I discovered at one of the schools where I’ve served as a Writer in Residence. Embracing connections and differences seems a perfect fit to starting the school year with a big welcome to a world of learning. Welcome to a World of Learning in my own classroom! Vol. 15, no. 5, Page 25 of Skipping Stones magazine features Haikus From Around the World. The poems were submitted by ESL Resource Teacher, Ruth Hoenick, from Atwater Elementary School in Shorewood, Wisconsin (US). At the time of submission, Hoenick described her school as “a diverse community of almost 600 students, more than 100 from 28 countries, speaking 14 different languages.” This has been my experience in teaching as well. First grader, Julian Toralballa, wrote Guatemala: Hot sun is shining/Smooth grass feels slippery/Running with my dogs. Second grader, Mahamed Hussein, wrote Somalia: Sunset in desert/Giraffe, cheetah walking slow/Hot Somalia. Third grader, Faisal Al-Timsah, wrote Saudi Arabia: Dark Half-Moon Sea Beach/Tall palm trees are sharp and smooth/Beautiful Red Sea. Fourth grader, Vitalia Dosta, wrote Russia: Light Russian dah-cha/Catching cold, scaly lizards/Laughing, joyful times. Fifth grader, Yuan He, wrote China: High timeless mountain/Sparkling stream trickles slowly/She Ma Shen mountain. Start the School Year with a Big Welcome to a World of Learning is a theme that sets your classroom as a stage for the development and presentation of great work. Children will eagerly “jump on board” the opportunity to travel a global community with you as their tour guide. Remind the class to pay close attention in school this year, to stay focused and on task so that they don’t miss the trip. ‹ Bulletin Board & Activity Designs that Fit Kids to a Tee! 3 Pings/Trackbacks for "Start the School Year with a Big Welcome to a World of Learning!"